Check out our current and upcoming dance classes listed below. Students taking any weekday class can attend our Weekly Tuesday Practice Session for FREE. Most of our classes do not require pre-registration, but it sure helps us plan better if you do! Be a pal and use the Sign Me Up form to pre-register for a class. Please come fifteen minutes early to the first class for sign-in, shoe-changing and orientation. All classes take place at the Champlain Club in Burlington. No partner is necessary to attend any class. Please wear comfortable clothes that allow freedom of movement and bring clean shoes with non-marking soles. Outside shoes, especially winter ones, cannot be worn on the dance floor. Take your moves and make them flow! Swing dance is a street dance – it is sheer fun and energy; a combination of connection and athletics. This energetic class will liven up your week with rhythms from the Roaring 20’s through WWII era Big Band Jazz - Creativity encouraged! Prerequsites: Must have taken at least four hours of beginning swing and know the six-count basic footwork, including triple-steps; please contact the instructors if you aren't sure that you meet the pre-reqs for this class. Cost: $40/person for the 4-week series. Please bring a change of clean, soft-soled, non-marking shoes to protect your knees and our wooden dance floor. This class will provide an introduction swing dance, also known as Jitterbug, Rock 'n Roll, or East Coast Swing. This is a fun social dance that is most often associated with Jazz and Big Band Music from the 1920s to 1940s, but can also be danced to faster tempo rock 'n roll songs from the 1950s up to contemporary music. 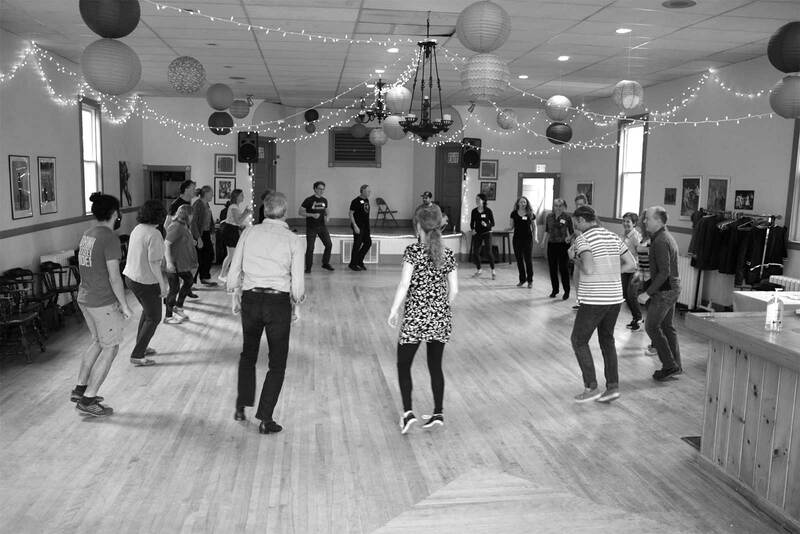 John & Mo will teach you the basics of the dance rhythm and movements to have you dancing with any partner by the first night and help you develop skills to use in any social dance environment from clubs to weddings and beyond! This class will teach a variety of moves and is designed to be progressive. We will learn new moves building on the skills of the previous week. No partner or experience is required. Cost: $10/$8 students for each class or $40/$32 for the 4-week series, FREE entry into the Practice Session. Repeat students $5 per class! Prerequisites: No previous dance experience is required; these classes are suitable for dancers of all levels. If you've taken this class as a follow or lead, try taking it as the other role! CANCELLED - Beginner Texas 2-Step in Waterbury! Learn the basics of Swing Dance with Terry and Cate. This is the starting point to go on to any style of swing dance, whether Lindy Hop, Jitterbug, Shag, or whatever. We will learn the fundamentals, including a six-count basic footwork, techiniques for leading and following, and several cool moves ... enough to have fun on the dance floor. Cost: $40/person for the 4-week series. No Partner necessary. This is a progressive series, we will learn concepts that build on each other from week to week. Please no drop-ins after the first class without instructor permission. Prerequsites: No previous dance experience required; these classes are suitable for dancers of all levels. Please bring a change of clean, non-marking shoes to protect our beautiful wooden dance floor. Questions about a class? Write to us at contact@vermontswings.com.